Brian Geisel, CEO and founder of Geisel Software, is an award-winning mobile and web app developer, embedded software engineer, and in-demand public speaker. A former radio host who effortlessly breaks down complex topics and presents them to businesses of all sizes, Geisel has hosted exclusive webinars for ExecSense, spoken at IoT Slam and other major organizations, and given formal and informal presentations for numerous small, medium, and large-scale groups. 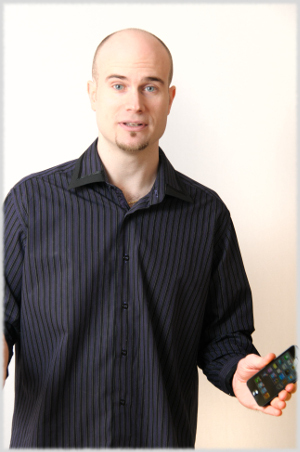 With numerous popular and profitable apps under his belt, Geisel specializes in iPhone and Android platforms. Geisel's most popular programs include How do I make money? A guide making money with your mobile app, Android or iPhone: Which platform is right for my app? and Designing an app that fits your specific business. The software CEO recently trekked to the jungles of Guatemala to teach students how to use computers, and also offers a popular, inspiring presentation titled From the cloud to the jungle: How teaching computers in Guatemala made me a better manager. Geisel is also a prolific blogger and has been featured in Entrepreneur Magazine, Minyanville.com, and other major outlets. He lives in Shrewsbury, Massachusetts with his wife Meire. The Internet of Things is a powerful industry that is quickly taking the technology world by storm. With Geisel's focus on both security and the IoT, learn practical, actionable steps to take full advantage of the Internet of Things in a way that doesn't compromise security. The Internet of Things is transforming the medical industry. While the rapidly growing IoMT holds unparalleled potential, it also creates challenges around trust, privacy, compliance and security. Geisel can discuss real- world solutions to some of these complex issues. Many businesses believe that using the right language is the most important facet of a global Web or mobile app. But there are many other critical things to consider, from cultural sensitivities to native buying habits. Geisel has significant experience creating apps for an international audience, and can deliver real-world knowledge on how to do it right. If your iPhone, Android or Tablet-based app must be in a language other than your own, poor translation of a phrase – or even a single word – can cause a major uproar or embarrassment. A software translation expert, Geisel can confidently speak on international translation for your mobile app, from pitfalls to practical tips. Few modern apps are developed solely by people in one country, and a growing number of software engineers manage BRIC teams with developers in Brazil, Russia, India, China, and other locales. With his long reputation of building and managing offshore teams, Geisel can teach your business or software team the ins and outs of international development, from navigating cultural differences to improving communication.